I visited the Cherry Creek Arts Festival here in Denver today. I go every year. As an artist I was fortunate enough to be chosen to show at this festival (one of the top 3 outdoor art festivals in the country) for 3 consecutive years back in the 2000’s. (I’ve since moved on to strictly gallery exhibits) As I was wandering around enjoying the art, I was struck by the conversations around me, and reminded of the “horror stories” shared by fellow artists (and experienced myself over the many years of doing outdoor shows) about rude and insensitive people, and even well-meaning people who unintentionally insult the artist. On the other side, I see many people who are intimidated by art and feel insecure talking to artists and asking questions. So if you are one of the millions of people visiting an arts festival (or gallery opening, or art walk) this summer, this “How to Talk to Artists” Primer is for you. And lastly, remember these folks are working hard and are here to sell their work. While many artists will not mind shooting the breeze when the booth is empty, don’t be offended if an artist excuses themselves from your conversation to greet/speak with someone else who may be a potential customer. Still have questions? This artist will do her best to answer them for you. Just ask in the Leave a Reply section. PLEASE NOTE: This post has generated a lot of discussion, and that’s a good thing. However, please keep your comments of a constructive nature, and refrain from rude and insulting comments. Thank you. An open letter to all: I deeply appreciate that you took the time to read and comment on my article. It is obvious that it has stirred up a lot of feelings on both sides of the fence, and that’s fine, however for the most part the intention of the article has been misunderstood. This post is for shoppers who may not know how to approach artists. It’s a “safe list” of conversation starters, delivered with an attempt at a little humor, if you will. I have put this together based on conversations with and comments from hundreds of artists over many years of art fairs and compiled a list of their largest concerns, which is what I am expressing here. It is simply an attempt to bridge a gap, to help people who may not know what to say feel more comfortable talking to artists. It is not by any means all my own personal experience and opinion. Of course artists need to be kind, always, and need to educate themselves about customer relations. That is not what this post is about. I am personally very grateful to be an artist, I love what I do, and always treat my collectors and potential clients with the utmost kindness and respect. In no way do I imply that anyone should do otherwise. I have allowed all comments to go through on this post until now, but that will change. Thoughtful and polite discourse that adds to the conversation is very welcome, but attacks, belittlement and insults are not. Everyone has a right to their opinion, but you’ll need to follow standards of decency and civil discourse if you’d like to join this conversation. Comments that violate this will be removed. Thank you for understanding. This entry was posted in art, Denver, lifestyle, shopping and tagged art, art district, art festival, art walk, artists, arts, Cherry Creek Art Festival, Denver, denver art, fine living, First Friday, gallery, gallery opening, how to talk to artists, outdoor art festival, questions about art, questions for artists, talk to artists, talking to artists at shows. Bookmark the permalink. ← Denver Alert! FREE Fourth of July Events Abound All Week! I haven’t read any of the multitude of responses you’ve been sent…so I’m sure my thoughts are not “new and undiscovered” territory. I’m wondering how much thought you’ve given to your own speech when talking to a contractor, engineer, butcher, chef, doctor, etc.? Many people pour their heart into their life’s work. Do you consider the feelings of the chef when you order a steak? Or any restaurant substitution, subtraction, addition, cooking method or temperature? Or suggest to a Carpenter or a Stone Mason how you want things done even when they tell you there’s a better approach to their work? I’m an author as opposed to a graphic artist, but your question struck a chord as I negotiate with many artists for book covers. Here’s the thing. In a booth, they are selling what they’re selling. Suggesting they redo a specific piece for me would be a problem. On the other hand I spend a lot of time talking to them about possible covers, inviting their input and working through a long process to get a result we’re both happy with. To look at your examples. In a restaurant, the server asks me how I’d like my steak, I expect to get it cooked that way. On the other hand, I don’t order a pork chop meal and ask for steak instead. If I hire a contractor there are two things going on. What I want done, and how it needs to get done. I want a new bathroom in this room in the basement. The floor is rock (not concrete) so there is discussion about methodology. I’ve got a pump which will work for what I want. The contractor checks it out and agrees. Now I get out of his way and let him does his job. If he asks a question, I answer, then get out of his way again. Not everyone operates this way, but my philosophy is if I’m paying an expert, let them do what they’re being paid to do. The point is context, and what agreement/contract I have with the person. If we don’t pay attention to that, we are going to cause ourselves, and others grief. A carpenter or chef is there to cater to your desires. An artist creates apiece and offers it to any one interested. Looking at it is free. That is what fine art is about. Just pointing out some differences. I did art fairs in the 90’s. I am overly sensitive and shy so I had a hard time talking about my work and was devastated when people said that they could make it themselves. I decided to open a retail store so I have toughened up over the last 18 years. 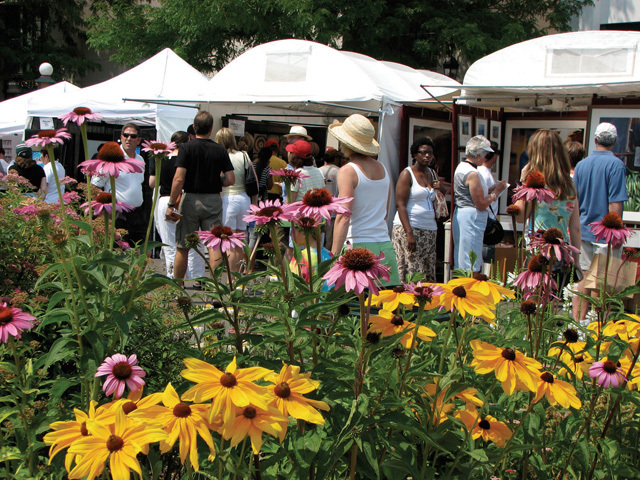 I am contemplating getting back into doing art fairs so have been attending many this summer. Everything is so beautiful and inspiring. One thing I noticed from a consumer stand point is how many pieces had no price tags (jewelry mostly). I really loved many pieces but was too shy to ask the price. I didn’t want to disappoint the artist if I couldn’t afford it because I know how that feels. I think pricing every piece is imperative. I think many people are afraid to ask. Agree 100%. I am shy too and if there is no price I will move on, even if I absolutely love the piece. I may come back to look at it multiple times (thinking maybe I’ll get the courage to ask) and will usually kick myself later for not but I can’t help it! Now retired I made a nice income for 35 years doing art shows. Of course I still paint; I’m still an artist. My husband and I had some laughs reading the what not to say section of this article. The average show day only gives us roughly seven hours of sales time and at least two of those hours are slow. I hate to lose time when people stop up the entrance to my booth by visiting with friends or come in to get out of the sun to text or wait for other people. I don’t allow it anymore. My mother having been an artist, we attended many art shows, craft shows and always enjoyed them! I can safely say I never asked any of the questions you brought up which are extremely important! But my mother taught us manners, the dos and donts in life! Things you just don’t say and for me I used to hear people ask the very questions you mentioned and wax always mortified! This is a very valuable article, and I hope people read but remember when at a show! Thank you! Thank you for your comments – so true! As a photographer, I almost gasp when someone wants to know exactly where I was standing when I took a particular photo. But the worst – and it has happened a few times – is a person asking if I really went to all those places. Now I just smile and say that probably some day you could send a robot to do the photography and stay home. If I were to write a piece on this subject, aimed at art aficionados, it would be two words: Be tactful. However, that wouldn’t be much of an article. I’m going to guess that 90% of people reading this consider themselves artists to some degree, so this is addressed to you. If you put yourself out there as a professional, some people are going to say things that will make you uncomfortable. Others will be downright nasty. Some of the nastiest comments about art come from other “artists”. Most successful artists I’ve met have the ability to see their art as product, and not children. Most of the successful artists I’ve met spend most of their time marketing. If making a living from your art is your goal, knowing how to deal with “patrons” is one of the biggest factor in determining success. There are plenty of great artists who struggle because they have not mastered their “customer service” skills. There are plenty of mediocre artists who do quite well because they have. If you’re selling your art directly to consumers at art fairs, I suggest you take a class or read books on how to sell. That is an art form itself. People will always say ignorant things. If someone says something which violates the above list, try to smile and use it as a learning moment, or even as a teaching moment. Learn to turn the situation around and you might increase your own success. Excellent point, and well stated. I think some of the issues that plaque “artists” in general are centered around selfishness in the thought that they are the only people on earth who have feelings and don’t like being critiqued, or interacting with less intelligent but well meaning people in general. I am a former career artist, turned to medicine for my career and art for hobby. If you are in a sales or service environment, no matter what the craft, you will deal with people of varying backgrounds and base knowledge level. If you have your work on display for the purpose of selling it, people will haggle because they are not mind readers, like your work, and are used to haggling. They don’t know what is in your head and that you don’t negotiate. Try not to take it so personally, and be aware that others have their own story and their own feelings as well, and are typically just as ignorant of your background and process as you are of theirs. I can’t tell you how many times I have patients who come in thinking that I am a dispensary for an antibiotic or other drug. It goes something like “I need some amoxicillin” when I walk in the door (the patients who don’t know me). And my response goes like “hi, what symptoms brought you in here today?”. I too have pride in my expertise and can feel somewhat insulted when my patient thinks their 5 minute consult with Dr. Google is equivalent to my long and arduous medical training. But then I then try to remember: they don’t know any better. I have read the article it is wonderful. I to am a creator. I have a question regarding being influenced by another artists work. I am learning new painting techniques on fabric. I spent lots of time looking at books and images on the internet. I chose one from the internet to use as a springing point. i chose to draw in one different animal and expand and modify the landscape, however, there are several parts that look very similar to the artists work that inspired me. I once read a article on copyright infringement and it said the work has to be changed at least 20% to be called your own. is this true? There is no “magic number” amount of change to get you out of copyright, at least under US copyright law. It can be tricky creating work that is inspired by but not copied from another artist. Style and technique cannot be copyrighted, but specific expressions are. Wow! Shocked that anyone would find anything about this to belittle. It is a wonderfully written and thank you for sharing. I am an artist, and yes I am sure guilty of a few of those questions posed by myself to other artists. Thanks for the insight and suggestions on what to say. Cheers!! Outstanding article! As an artist myself, I hope I have never been guilty of any. I agree with all your observations and insights! My friend sent me this as we have talked a lot about some of these very things. I taught textiles for a decade in an Art College, and tried to instill in my students a sense of realistic good humour about doing shows and sales; they were going to need it in the future! As for taking pictures of peoples work, this is the one thing that drives me round the twist! Because of the ubiquitousness of cellphones, its hard to police. I have a little sign of a camera in a circle with a line through it. I post them in a few spots. It seems to help, at least I’m not having to say over and over, “I’m sorry, but we dont allow pictures to be taken of the work”. Its embarrassing and usually leads to awkward conversations, and probably lost customers. Who knows. As an author I hear people say they’re going to write a book when they retire. I smile and encourage them, knowing 90% will never get past the first page. That’s not my problem, and they aren’t competition. I’ve also had people give me brilliant ideas that I ‘just need to write’. I smile and encourage them to work their own ideas. I sell books at a few shows, nothing as traumatic as art shows, but usually with artists around. This is where I find a lot of my cover artists. I’ve surprised more than one artist by suggesting a book cover is worth $300 for a start for original art. I had one person tell me they’d charge $40. I haven’t followed up since I don’t want to work with someone who undervalues their work. I’ve also talked with people whose work on covers starts at over $1000 and goes up from there. We have nice conversations about the book covers they’ve done. I guess for me, whether it is a painter, writer, cook, sculpture or whatever. Treating them and their work with respect pays off, and make everyone feel better. Spot on. Wouldn’t change a word of it. Thank you for writing this very informative and interesting article. Great “food” for thought. I very much appreciated, and enjoyed reading it. Love this article. I don’t exhibit or sell, but I understand the frustration of unanswerable questions and rude comments. Great comments! I attended an art show yesterday and tragically heard some unthoughtful comments! I applaud all artists brave enough to share their work, share their inspiration and technique- all of which is different and equally inspiring for that reason! Thanks too for posting constructive and qualitative questions to ask artists! I make coil baskets. In fact, I make Norwegian baskets because I am Norwegian. I have been asked by many people (all white) “Are you Indian…. ?” Two different times I was asked, “Are you making that…. ?” Many, many times People have watched me for a while and then told me, “You should see the baskets at the ?????? museum. They are gorgeous…..!” or “My aunt makes beautiful pine needle baskets.” All these questions come freely without any comment about what I am constructing in front of them. Thank you for taking the time to write this article. In my opinion, as a fellow artist, I believe you did an outstanding job both in wording and content! I have experienced every aspect of what you have mentioned and believe there is nothing to argue over when you are trying to educate the masses in a kind and compassionate manner. I used to work at summer art shows with friends when they needed extra help. Some of the most amazingly awful comments I heard were: “I bought one of your pictures last year at this show; now it doesn’t match my living room. Can I return it?” and “If I buy this picture, could you erase the writing down here on the bottom?” (this writing was the artist’s signature and the limited edition number!) The work was my friend’s, not mine, but these insensitive comments still made me really upset. I think you did a stellar job. The open letter seems to imply there may have neen negstive feedback. I personally have no idea why. Wonderfully written thank you. When all else fails everyone needs to remember to be kind and mindful. Great article as I am coming up to my first ever art walk as an artist this let’s me see what I mentally need to be prepared for. Thanks for doing this. I enjoyed reading this article. I have never said anything to an artist except “Beautiful work!” After I had an artist reply, “Yeah, well compliments don’t pay the bills,” I now just smile and nod politely. I wonder what he would have done if I had insulted his work? Haha! Thank you for a wonderful article. I’m a flameworking artist, a medium most people know little about. I’ve come to realize that people want to engage with me without feeling stupid. The only “safe” thing they can think of is, “How long did this take you to make?” Perhaps they just feel the need to say something or they are trying to start a conversation. But I think many don’t understand the process and are trying to get a sense of what goes into the work they are seeing. I’m not insulted by this question and think of it as an opportunity. Sometimes I’ll answer with the number of years I’ve been studying and working in glass, sometimes I’ll smile and tell them my age because everything in my life has led to this, and sometimes I just say “a long time. ” I may go on to explaining some of the processes that go into making my work. All of those seem to work fine, may result in further conversation, and maybe even a sale. one of the a first outdoor fairs I ever did was in Staunton, VA. i was nervous and shy, but visitors regularly thanked me for coming- even when it was pretty evident that we had different ideas and tastes going on….that was great encouragement and good manners. thanks in part to those folks, I’m still doing outdoor fairs some 30+ years later. Courtesy on both sides is called for, and understanding that some folks just don’t know how to speak nicely. Thank you for coming to our show is still a good way “out” of the dilemma. I enjoyed reading about what you had to say. Thanks for helping me get more out of going to a art show. It will help me in having a better time in talking with the artists there. Thanks Janet! I’m so glad many people are getting something of value from my article 🙂 Have fun out there this Summer! We did shows from the early 80s until Somewhere in the tooth 2000teens When my business partner became too ill to continue and I could not handle it all alone. Are set up was anywhere from 6 to 8 hours with the large chose artist from the West Coast or East Coast which frequently group together and bringing a large truck to transport things. At many shows people completely repainted the entire booth and pedestals. They would be so exhausted by the time opening night occurred that they could barely talk and yet they do it I know very few who were rude to people but I knew hundreds of attendees who were in unbelievably rude. We were once doing a show in New York City where a customer who is been one of ours for years finally made it to Chicago because we told her what a wonderful city and to Denver the following year. They were very excited to tell us that they had found a shop that carried athingour things. We politely inform them that it was hours store they informed us that they didn’t think so we informed them that we didn’t sell to anyone else in the city at which point they looked us up and down trying to decipher. My standard remark to people who wanted the discount was that I could not undercut saxswith Avenue or Neiman Marcus. But they were welcome to go see if they could bargain with them. Will you steadfastly refused to discount any orders work in our stores and would always explain that it was a disservice to the artist in they’re work. When people would ask how long it would take we would explain the entire process of everything not our secrets but the process involved before the final product was ever achieved. our logic was that even if they weren’t going to purchase or we’re not able to afford our work. They would be more educated with the next person that they saw and be able to Understand and appreciate what they were looking at. I think it is absolutely wonderful that you wrote this mandatory reading for all attendees . unfortunately Most to need to see this Walmart but thank you for sharing it it is very well written into the point.